Bethereum is a decentralised, social betting platform based on Ethereum technology and smart contracts.Currently existing solutions for online betting carry a set of problems that make it unattractive to many potential users. These include transparency, security issues, lack of social character, and the perceived unfairness of conventional betting. The objective of the Bethereum framework is to allow for an intuitive creation and deployment of betting smart contracts that operate directly on the Blockchain. 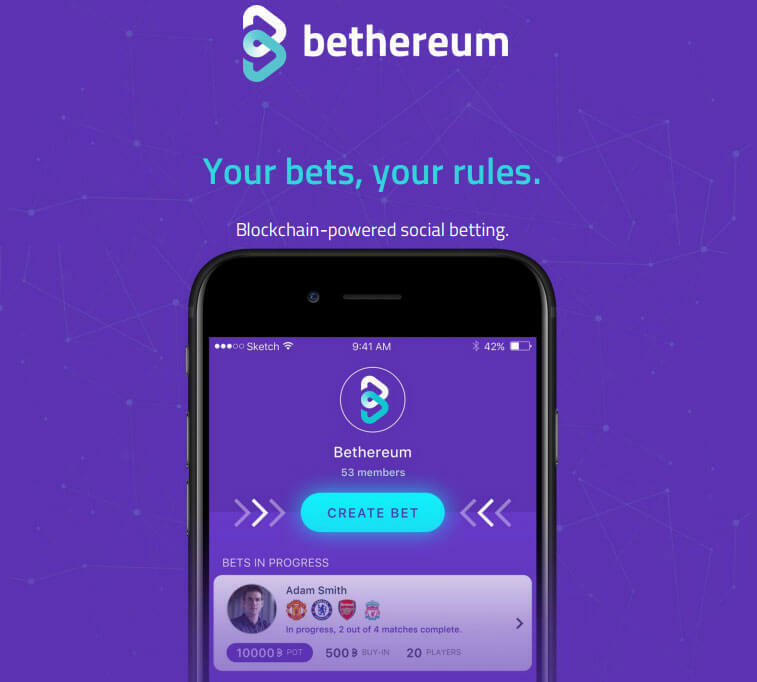 The Bethereum application client enables a user to place bets on the outcome of future events and earn rewards in Bether tokens for correctly predicting the true outcome. Smart contracts guarantee the transparency of each transaction and payment of winnings to victorious bettors. This is the most convenient way to place bets secured by smart contracts: The entire process can be completely realised through your mobile device, typically in less than a minute. Our solution emphasizes the quality of user experience, and the social aspect of betting, with a particular focus on building strong communities. We aim to create a broad online platform that will make the entire betting process accessible, easy to use and attractive also for more casual bettors. Broadband and mobile connectivity literally put betting in the hands of millions. But centralised, conventional betting suffers from serious structural shortcomings (see “Industry Challenges” section). The advent of Blockchain technology ushers in the opportunity to redefine the industry, delivering a solution with all the advantages of conventional betting and none of the drawbacks. At its core, Bethereum is a social betting platform, allowing people to bet on events with other players without going through a “middle man” (e.g., a bookie or betting provider). It operates as a fully decentralised, secure solution built on Ethereum-based Smart Contracts. All bets are carried out using Bether, our purposefully designed ERC20 token. Bethereum is safe, transparent, provably fair, and simple to use. It’s this easy: you create a bet on one or more events, designating the minimum amount and how winnings will be split. Others join the bet (with their own event predictions). After the events end, Smart Contracts automatically calculate the winnings and award Bether tokens based on the agreed split (e.g., winner takes all). From betting on local teams to joining our exclusive High-Roller Club. Smart Contracts shield funds and bets from manipulation. All transactions are on the blockchain. Once a bet is finished, Smart Contracts immediately pay out the winnings. Android, iOS and web app. Other sports, eSports and fantasy.